Incorporated in Taipei County, Taiwan in 2006 with a capitalization of NT$290M, Amazing Microelectronic Corp. is the first professional ESD solution provider in Taiwan. For the ESD technology core, we also provide EMI filter and interface component integrated with the ESD circuit. Additionally, the CTO position is held by an IC reliability expert who owns over 180 patents in several countries. With the experienced R&D team, we not only provide professional ESD solutions, but also assist our customers in reaching the peak of industry to gain high profits. AMAZING provides powerful ESD protection TVS Array in all kinds of package. 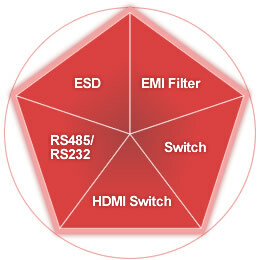 What your products need is Amazing ESD TVS Array’s superior protections. AMAZING’s EMI Filter could be applied to Mobile, Tablet, Laptops, GPS and all portable devices to filter noise. AMAZING launched Analog Switches for all kinds of signal specifications with low On-Resistance, high Off-Isolation, wide bandwidth, built-in system level ESD protection and which is the best choice for signal switching. AMAZING provides you the HDMI-1.4 Switch with superb ESD TVS integrated.